What Mr. Pruitt does seek is to restore the EPA to its proper role of administering legitimate environmental laws within constitutional and statutory bounds, rather than leverage it as a tool to placate environmental extremists regardless of the costs imposed upon American consumers, businesses and workers. This week, departing First Lady Michelle Obama invited derision when she lamented to Oprah Winfrey, "We feel the difference now. See, now we are feeling what not having hope feels like." Uncharacteristically for a First Lady, Mrs. Obama had campaigned desperately on behalf of Hillary Clinton, so perhaps her negativity should come as no surprise. Although she represents liberals' widespread post-election despair, however, other Americans apparently disagree. For example, a Rasmussen Reports survey released this week found that, "Following Donald Trump's election as president, Americans are more optimistic about the future than they have been in over four years. A new Rasmussen Reports national telephone and online survey finds that 47% of likely U.S. voters now believe that America's best days are in the future, while 33% say they are in the past." To place that in perspective, in the weeks following Barack Obama's 2012 reelection, the same Rasmussen survey found that only 35% of respondents believed that America's best days were in the future, compared to 49% who said our best days were in the past. And in the middle of Obama's second term in 2014, just 34% of Americans said our best days were in the future while 51% said they were in the past. Americans' confidence in the economy remains higher than at any point since January 2008, with Gallup's U.S. economic confidence index averaging +8 for the week ending December 11. This score is unchanged from the prior week, which marked a record high in the nine-year trend... Rarely has Gallup found such a dramatic shift in Americans' economic confidence over the past nine years as it has in the past month. Again for perspective, Gallup's index stood at -11 immediately prior to Trump's election. Reflecting that sudden sense of optimism, U.S. markets have successively ascended to new record highs since Trump's election. To understand all of this, look no further than Trump's cabinet and regulatory agency selections. In particular, consider Scott Pruitt, Trump's choice to head the Environmental Protection Agency (EPA). Over the past eight years, perhaps no regulatory agency better illustrates the rogue, unpredictable, job-killing, economically destructive, extra-legal bureaucratic overreach of the Obama Administration than the EPA. Unable to accomplish its goals through the proper legislative process, the EPA has all too often resorted to imposing its extremist agenda via regulations unsupported by law. Its arrogance reached such extremes that it even triggered a unanimous rebuke from a U.S. Supreme Court typically divided sharply along ideological lines. On multiple occasions, the Supreme Court and other courts rejected EPA efforts to regulate American citizens and businesses without any legal authority for doing so. Current EPA Administrator Gina McCarthy even professed an explicit goal of killing the domestic market for coal, and along with it the jobs in impoverished areas of the country within that industry. 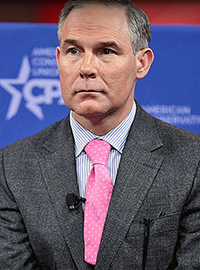 Enter Mr. Pruitt, who as Oklahoma Attorney General successfully sued the EPA and other abusive Obama Administration agencies during his tenure. To be sure, Mr. Pruitt acknowledges that the EPA can play a positive role in safeguarding the nation's air, land and water quality. He is not the extremist of liberal caricature, and seeks not to abolish the EPA entirely or somehow rescind the nation's environmental laws wholesale. What Mr. Pruitt does seek is to restore the EPA to its proper role of administering legitimate environmental laws within constitutional and statutory bounds, rather than leverage it as a tool to placate environmental extremists regardless of the costs imposed upon American consumers, businesses and workers. In addition to restoring the EPA to its proper role within the federal government vis-a-vis the legislative and judicial branches, Mr. Pruitt also understands as well as anyone the need to return it to its proper role vis-a-vis sovereign individual states. That was precisely the focus of his efforts to check EPA abuse while serving as Attorney General of Oklahoma. All of which helps explain the sudden optimism among markets, entrepreneurs and American citizens. Voters elected Donald Trump because they demanded sensible change in the nation's course, not business as usual. In nominating Scott Pruitt to lead the EPA, Trump has chosen a leader who exemplifies that sentiment perfectly.